Posted by Leanevdp in by Theresa Byrne, Seasons, Feast Days, etc. It looks like Rosie is about a year old here so this picture is 19 years ago. Time passes quickly, indeed it does! A lovely excerpt from our second born, Theresa Rose (middle back row), for this Throwback Thursday…. Childhood memories of Christmases Past brought back the thoughts of simplicity….which played a huge part in our family’s Christmas joy! Thinking back to when I was young Advent always started with the appearance of the Advent wreath and the making of our stable. There was a joyous preparation, not hurried, rushed or bought. We would lay straws in the manger for each sacrifice we made throughout the days leading up to Christmas. Growing up there was not extra money, especially at Christmas, since Dad’s construction work could be quite seasonal, so my parents often did not buy Christmas gifts. We didn’t see Dad and Mom stressed over having to buy gifts they couldn’t afford. We were normal kids and presents were just as exciting to us as to other kids. Grandma and Auntie Janice (on my mom’s side) would bring over beautiful parcels, enough for all! This in itself became a tradition…. Oooing and Ahhhing over each beautifully wrapped present….and we were very grateful for everything we received! We looked forward with anticipation to St. Nicholas Day, where Dad and Mom would do a puppet show of St. Nicholas and Black Pete. We would receive stocking plump with snacks and treats! As the years passed, we were able to buy gifts, but the emphasis was never on the getting, but the giving. Some years we would cringe when Dad would make an announcement that we should pick a favorite gift that we had received to give it to another child who had less. We were not made to do this, but we were encouraged. And we did. Every Advent we would put together a basket or cut wood for a family in need. This instilled in us children how truly blessed we were. There were others suffering and cold, while we were warm, safe and happy. We would start the St. Andrew Novena on November 30th and down to the littlest fellow that could talk, we would wait for our turn to repeat the beautiful “Hail and Blessed” Prayer. Some of my favorite memories are when we would all pile into our old Volvo and head to Rossville to view the lights. What a thrill…the color, the magic, the beauty! Our first snowfall we would take bowls outside and pack them hard with snow. Mom would pour honey and cinnamon on our snow and we would have homemade candy! One Christmas especially stands out in my mind….we knew Dad was doing something special and secretive in the evenings leading up to Christmas. After Midnight Mass that year we came home to beautiful, homemade stockings, filled with gifts and treats that had been made with love and care by Dad! Another year, when we were teenagers, Dad made us each our own ornament. He cut out three pictures of each child and created an ornament with glitter and glue. On the bottom of each ornament Dad had written something. Mine said, “Our Blooming Rose!” We were so proud of each of our ornaments! As the weeks of Advent passed, Mom would spend one of the afternoons with us making cookies. Our “Cherry Flip” recipe was a favorite and came from an aunt that Mom loved. It was a shortbread cookie make into a ball, stuffed with a cherry, baked, iced with cherry icing and dipped in coconut! Yum! We made other kinds, too, and we then froze little parcels of the cookies for family and friends, which we handed out after Midnight Mass. Dad was kind of a Scrooge about the Christmas tree. Many years he would go out back and cut us a rather ugly, Charlie Brown cedar tree. This is the part of Christmas that Grandma was often the hero, and mysteriously a lovely tree would show up! Since then Dad has mellowed and if Mom asks, he will pick up a tree on his way home from work. Just a few days before Christmas, often Christmas Eve, we would decorate the house and the tree. Midnight Mass was where Christmas began for us. Dressed in our finest, we headed out into the darkness to finally celebrate His Birth! Arriving home, the baby Jesus, so beautiful, would be laying in the little manger, where He had miraculously appeared while we were gone! Out came the cookies! On came the Christmas music! Joyous and fun, our Christmas had just begun! In the morning, after Dad finished reading from the Bible about the birth of Christ, we opened gifts, turned on music, ate good food (and more cookies) and started the turkey for Christmas dinner! In a one-bedroom home, seven kids, not a lot of money, all of these traditions happened…. Where lack could have been felt, joy was added. We did things together preparing, getting ready and finally celebrating! In the end, Our Savior was born and we always had a very Merry Christmas! Coloring pages for your children (click on them to get full size)…. Sign up for the Giveaway by clicking here. Fall Coloring Pages for your children. Teach them to be thankful for lovely autumn days! Come and visit Meadows of Grace for some lovely and unique gifts! 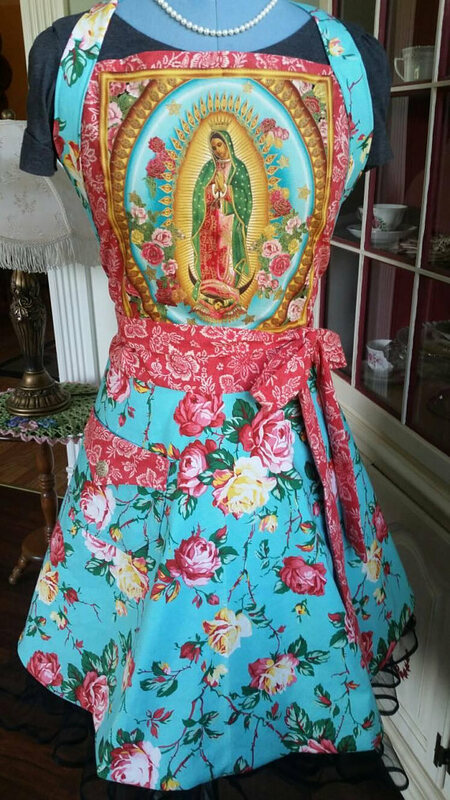 “Old World Charm” Apron! Feminine and Beautiful! A lovely excerpt from our second born, Theresa Rose, for this Throwback Thursday…. Modesty, Humility…. Father speaks of humility. Topics include: work, recreation, sports, exercise, & parties. Excellent sermon! Have you ever been so excited that when bedtime comes, you feel like you couldn’t possibly sleep a wink? When you finally fall asleep, it is a restless tossing and turning while your subconscious is still wide awake…. That was me, age 10, Friday night before the Farmers Market. I lived and dreamed of the Saturdays that my dad and I would be up, before the rooster crowed, packing the trailer with baked goods, veggies and whatever else we planned to sell. My sister, Virginia, and I had to take turns on Saturdays but she tended to like her rest more than the thrill of the open market, so many times I could convince her to stay home and let me take her place. I could feel the excitement down to my fingertips, as we pulled into our selling spot among the other venders. I couldn’t understand my sister happily sleeping at home while all this was taking place, but I was glad to have taken her spot! We would set up our tables and get ready; sales stared at 7:00 am sharp! As the years passed I established quite a clientele for my baked goods. I hand-painted a sign that said,”Tweety’s Sweeties,” and many an old fellow would dream of Saturday and the fresh apple pies it brought! I loved being in charge of our stand and my dad had time to wander and build relationships with other vendors, while I wheeled and dealed. A couple of times we went and picked up trailer loads of watermelons, from the Ozarks, to add to our Saturday sales. My younger brother got into hand-squeezed lemonade and we would put a big sign on him that said, “Follow me for fresh lemonade.” Then he would wander through the crowds of people and drum up business. Good, good times! Good, good memories! A few weeks ago when my Brendan excitedly told me about how Angelo, my youngest brother, was going to have booths and do a sale, all I could see was little me, just waiting for Farmers Market Day! The day was set; the sale would take place at Grandma’s house. All the cousins were excited and we had two weeks to make our wares. Devin, my husband, and Brendan decided on sling shots. (Devin makes a wicked sling shot!) They got to work, felling dead and overgrown branches, finding any limbs with a V shape. After trimming off extra leaves they had enough to make thirteen slingshots. They let the wood dry and about a week later you could find us in our shop, the sander on and camo duct tape ready to go. Devin cut to size, while Brendan and I sanded and then we all put them together. This was a bigger task than it sounds but some great family memories were made. As the day of the sale approached, the kids’ excitement mounted. Just like Christmas, half the fun is preparing for it! The day before the sale we picked blackberries and Sienna and I made honey blackberry muffins. We wrapped them and priced them at 25 cents apiece. Yay! The day of the sale had arrived! At 5:45pm, on Sunday, the fun began. All the parents went traipsing down through the weeds, through some of Grandpa’s junk, down to the far side of my parent’s property. The boys had mowed a spot, set up little booths and a couple small tables for tired buyers…. My younger sister ran a concession stand with your choice of drinks, snacks and fruit. There was a booth of hand blacksmithed knives which were unique and priced to sell. Then we had a couple booths with small toys and trinkets. The ice cream lady was down the way and you could get a finger lickin’ cone for 50 cents! My Brendan’s slingshots sold like hot cakes and he brought in a whopping $6.00! Sienna’s blackberry muffins spoke to the more health conscious buyers, with Grandpa being her best customer! She sold out and was shopping within ten minutes of opening! A true girl, she spent every penny she had on her, while Brendan saved back the majority of his earnings. My nephew, Toni, had set up a game with a bunch of empty shotgun shells on different levels. There was a starting time and by it a bucket of gravel. For 10 cents you got a minute of time to try and knock down all the shells. You should have heard the laughter as the young (and old) guys tried to outdo each other! There was even a spot the boys had set up that, if you wanted to chat and chomp on your wares (or smoke a cigar) you could do it at their little outdoor coffee spot! When our coins ran low, hot and a little bug-bitten, we headed back up to the house. No amusement park, fair, circus or the like, could have held a candle to the fun the kids and the parents had that day! Without a doubt, this was a day to remember! All 3 Maglets! Sunshiny Disposition, True Womanhood and Advent/Christmas Finer Femininity Magazine Booklet Package of 3! I haven’t forgotten her words and I bet the old man hasn’t either. I think different people would have different answers. I think back to my teenage years, the get-togethers, the fun, the go, go, go. My parents monitored things closely and we had lots of good, joyful, wholesome fun in a home open to family and friends. I worked by waiting tables at a small hometown restaurant, ran the Junior Legion of Mary, cooked and baked, and sang for our choir. Rosary was a daily part of our lives, sprinkled with daily Mass and St. Theresa novenas. People flocked to our home because it was stable, joyful and good. Dad and Mom sacrificed their home and time, to keep an eye on things while being a part of the games and activity. We had Paintball Wars! The boys played and the girls cooked and took care of the wounded! The Traditional Family Weekend originated through Mom and Dad about twelve years ago and twice a year, families from different states came together for music, dancing, talks, Mass and just a wholesome family time! I traveled twice to France with good Catholic friends, for the Chartres Pilgrimage, then took a jaunt with the leprechauns to the homeland of the Irish. While we were there, we danced, we sang, we prayed, we lived with no regrets. Being in such a good situation gave my siblings and I a chance to get to know many good men and women…..a golden opportunity for when the time was right to choose our spouse! Many good marriages came from my parents being open to these get-togethers and having a home open for good people. So, as you can see my youth was filled with faith, fun, stability and many good young men to choose a spouse from. I was at peace and happy but my heart wasn’t full yet. Then I met Devin, my future husband, at one of our Traditional Family Weekends…. I am grateful, so grateful, to my parents for the sacrifices they made for their children. I entered marriage pure, with no regrets. I am grateful for the nights they stayed up late and for the brother or sister who was always chaperoning when we courted. We have three children now and time has flown. Each day is precious! From holding our first little boy to watching him receive his First Holy Communion….All the happiness I have experienced in the past, could not come close to the joy I felt when my first-born received Jesus for the first time! From the time I married a wonderful man and have been given three children, I have been blessed. We have had our ups and downs along the road. Mono put me in bed for a year and with it came a lot of anxiety. When I got well, life was all the sweeter and I was more aware of my Faith. My husband and I delight in our children. Together we watch the birds, check for eggs and view the sunsets. Our family is our joy! When something good happens, the kids always call Daddy at work. He is interested in what his children are excited about and this is how we share the good times, even when he is not home. Each day is an adventure, sometimes you laugh, sometimes you cry! He’s right! Every day is a miracle! When I look at my children I feel a sense of urgency. They have been given to me for such a short time; I must take advantage of this moment. When I can go to bed knowing I have read with my children, prayed with my children and laughed with my children, I am at peace. In fact, I have never known such joy, as what daily living with my husband and children have given me. The hard times make the good times better. I wouldn’t change my life for anything! Lovely handcrafted items available at Meadows of Grace Shoppe! I love this time of the year…the smells, the lights, the getting ready for His coming! Since I was a child, Advent has always started with going outdoors, into the fields and creeks, searching for bark, stones, moss and any unique berries or native grass, to make our Christmas stable. We looked forward to this day, as kids, for many reasons….a day off school, time outside gathering neat things from nature, but most of all the tradition of putting together our stable, in readiness for the birth of our King! The stable was a focus in our home growing up and each year we tried to outdo last year’s creation. With ponds, fences, valleys and hills in our scene, it got to where it covered an eight-foot table! Now that I am married and we have our own home, we carry on the stable tradition, just in a smaller four-foot version. Another thing we did when we were kids was go searching for our Advent wreath, which had been in hiding for almost a year. The first Sunday of Advent we would light the first candle. We took turns every night lighting it for Rosary time. I am married to a carpenter, so our Advent wreath has a different look. We call it our “Advent Block”. It is made from a leftover post, trimmed to size by my husband, decorated and holes drilled in the top, where our candles stand, purple and pink. Usually and by now we would have made a manger for the kids. They put their straws in it for each sacrifice they make…..providing a safe and warm place for the Child Jesus to lie. I would be organizing and getting the house ready for the great Feast Day. We would have cookies baked and stored…Christmas cards ready to send. My children and I would have started wrapping a few gifts, in the evenings, for cousins, grandparents and friends. We would look forward to the week of Christmas when we decorate the house…a splash of poinsettias, lights and garlands would make their appearance! Christmas Eve, sometimes the day before, we put on the Christmas music, haul in the tree and decorate it! Devin does the lights, the kids and I finish it off with golds, reds and greens! This year has been very different. I am pregnant with my fourth child and very sick. This is my third pregnancy that has started this time of year. I am overjoyed with a new soul, a new baby, growing inside me, but truth be told, it is hard on me to let go and lay sick, while I want to be up and preparing for Christmas! I have had my times of tears, in my big chair where I am planted, knowing everyone else is preparing….baking, excited! From a mom who loves making traditions, enjoying everything from the lights, the smells, the carols….to a mom laid out, that can’t handle the smells, can’t move to make traditions happen, sits and watches as her husband take over the house, the kids, the cooking….yes, it has been hard. Then, the other night, it hit me! In my mind’s eye, I saw Our Lady traveling and very pregnant. At the end of her months, with no thoughts of herself she followed her husband to Bethlehem. I am sure the long journey was bumpy and cold. Being due to have her Child, Our Lady must have been very weary. Her answer was, “Yes” from the time the Angel appeared and asked her to be the Mother of God to the time her Son hung on the cross for our sins…..
And then, as we all know, in a drafty stable, surrounded by the sounds and smells of the animals, our Savior was born. Handcrafted, durable rosaries and rosary bracelets available here…. A unique and special gift for Christmas!